Am in the process of moving my computer and desk at from a shared space to my new (small) study. 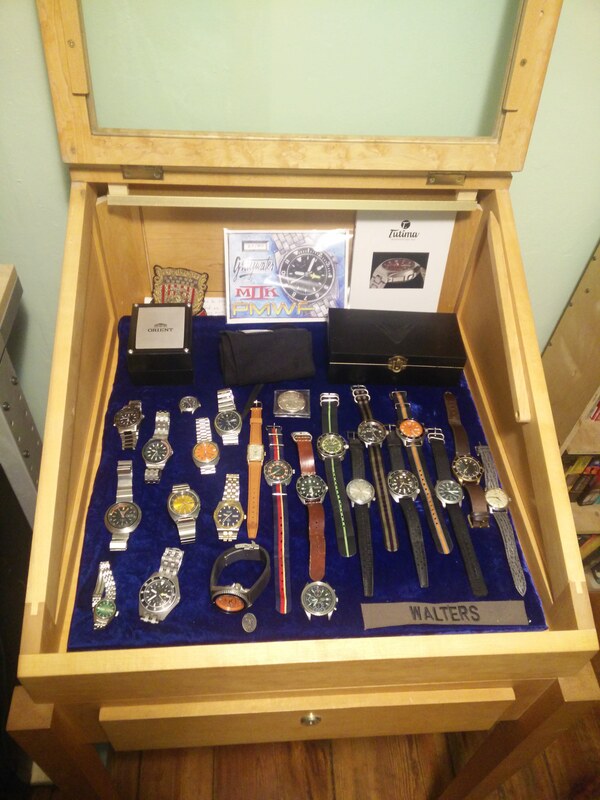 First things that I've set up beside my writing desk is my watch collection. Seemed like a good opportunity to share what the current state of the collection is. Oldest wristwatch is still the Hamilton Illinois that my father was given when he graduated High School (first in his family). Newest is the Ventus Mori. The display is a custom piece made for me by a guy named Peter Turner way back when we were still blowing glass (20 years?). We bartered some of our glass for it. It doubles as a standing writing desk (there is a piece that fits over the glass in the lid that serves as a writing surface). I know the collection is smaller than some, but I have really stopped buying watches for now. There are a few "grails" out there I wouldn't mind owning (and I still am soft hearted when it comes to funky '70s diving watches), but I have really gotten the itch for another vintage Power Wagon and am putting money aside for that purpose.